Hey all. This is a new location for map requests. Don't worry if you've already requested a spot, you don't need to submit a new one. Can I get onto the map? Any nation wishing to join the regional map must have a regional Influence rating of 30 SPDR or higher. You can check your regional influence here Influence is a measure of a combination of World Assembly endorsements and length of time spent in a region. Nations below 30 SPDR must wait until they reach that level before applying. How big can I be? You may not request an area for your nation larger than approximately 500 by 500 pixels (a 500×500 box is located on the bottom right of the map for reference) on the full uploaded map scale unless you have 100 SPDR or over. If you surpass 100 SPDR and would like to request a larger size, please telegram the cartographers with your new request. You may request a specific size for your nation so long as it is below the requirements listed above. You may request a specific location, access to a river, water, landlocked status, etc. so long as it is within reason. If you would like your nation in a specific location on the map, please check on the biome chart below (WIP) to make sure that its climate matches that area appropriately. The cartographers reserve the right to refuse to add or to edit any nation or feature on the regional map. Significant geographical features (mountains, rivers, etc.— and where they are located): Nacelle should be where Queen Charlotte City is in the following map and Masset Inlet should be "Tribble Inlet", also "Tribble Mountain" and "Tribble Forest" should be located on the N island near "Tribble Inlet"
Any other information or requests: As large as possible please. I would prefer placement in the northwest. Climate/biome: Temperate broad-leaf and mixed forest (west/north Europe, as an example). 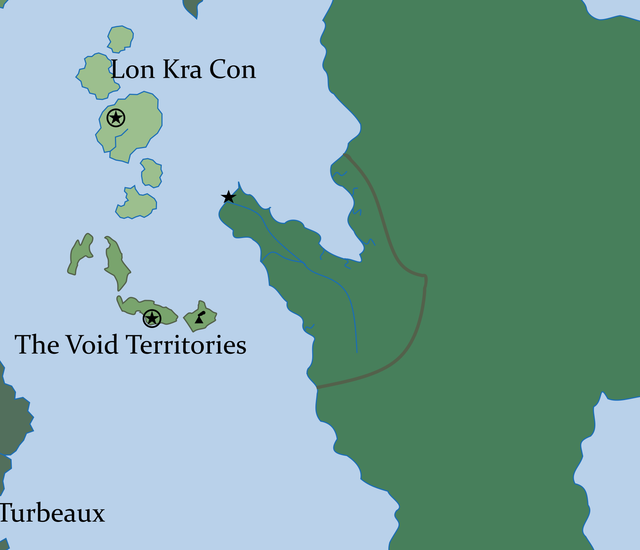 Location if you have a preference: Eastern Uncharted Wilderness, around the peninsula that juts out towards Lon Kra Con and The Void Territories. Significant geographical features (mountains, rivers, etc.— and where they are located): I would like the coastline to have Norway-esque fjords if possible. If not? Then at least a series of small rivers that interconnect the coast. I'm also thinking two major rivers. The first stretching from the tip of the peninsula and running down the length of it, a smaller river joining it from around halfway down the coast. The two meet, and continue as one river deep into the territory. The source of the river is the highest point, with the rest being hilly or flat, and mostly forested, save for the towns that dot it here and there. The capital would be at the mouth of the long river that empties out near the tip of the peninsula. Any other information or requests: I know it's slightly over the 500x500 limit, but I do have a SPDR over 100 (318 at the time of this post). And I tried to keep it as close as I can manage. Still? If you think it's too big? Feel free to shrink it as you see fit. @Areulder Can you please add that text to your map despatch aswell. Mozworld I could, I'd like to keep all the signups in one place though.Once i'm caught up on the queue I'll convert this thread into just signups and have the dispatch for displaying the map, and any other maps we decide to make off of it. They're holdovers. I need to go to the old map and see who they are, They do have labels, but I can't read them, or render them since I don't have the font they were written in. I've done a few, but probably won't do all of them until i'm all caught up and start prettifying the labels. What are the lands that don't have names on them yet? We need somewhere permanent and visible though to tell people where you want them to go and how to get on the map. Currently that information is in Mount Seymour's old map despatch (that I'd like to remove) and here. Something needs adding to the despatch to either tell them the information above or to tell them to come here. Mozworld As someone else stated on the RMB, I think that it is a bad idea to force nations to use the forum. That's me being dumb. I started out making things yellow because I was just doing sketches, and never changed once I started putting nations on the map. I'll get on a dispatch for requests. Zwangzug I don't think so. There's no images in your request. Until the map is complete, could we maybe have a link to here on the WFE next to discord link or something that says 'request a place on the map'? Climate/biome: Humid Rainforest that gives way to a Moderate Savannah. 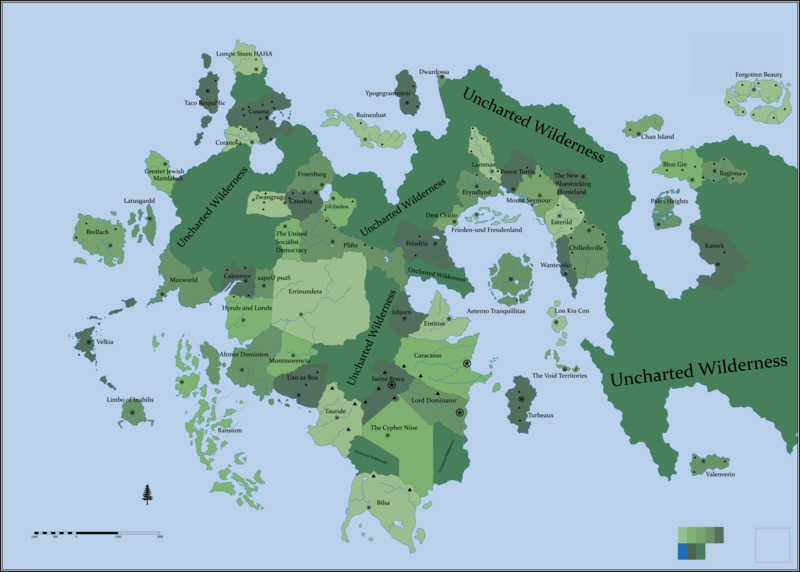 Significant geographical features (mountains, rivers, etc.— and where they are located): The mainland of Altmer Dominion is relatively flat, taken up by Forest and Savannah. The only notable geographic feature is a small isolated island off the coast, much more moderate in climate. This is the ancestral homeland of the ruling Altmer, which keeps them apart from the rest of the Dominion. Notably, the Dominion Capitol, Elden Root, is located in a large tree on the mainland in the midst of the dense rainforest of Grahtwood. Obviously, the lore this nation is based upon is rather heavy. However, I admit I provided a ton of extraneous information here. About all that really needs to be taken into account is a.) an approximate Climate/Biome, and b.) a small island off a populated mainland. If the general idea is there, it'll work for Factbook purposes. I'm looking forward to seeing the finished product! Is that the shape (outline) I sent to the crew previously? Perhaps I'm confusing myself, but is the color key correct? All of the orange/yellow (sketching) requests appear to be present on the map, but none of the green (completed) nations look like they're on the provided map. Are they the non-labeled countries? Turbeaux Even though I am a complete proponent of the forum, I fully agree with that. MountSeymour I am also a proponent of the forum, but conducting basic actions on it exclusively would be quite unwelcoming. Areulder I put two Imgur links in the "additional information" section, are you able to see those? I don't want to make more work, but I've had an established IC map for many years and I'd love to be able to keep that consistent. It doesn't need a separate dispatch, just some text adding to the existing one. "See this lovely map here, want to get on it, here's how..."
@Areulder And feel free to copy the dispatch under my nation into your own account. We can then just remove mine entirely. I completely missed them I'm afraid. didn't even realize they were links. I think I can make it reasonably faithful by shifting you down a little.